If you really want to know the water temp…. Today I hung a pool thermometer out on the outer rope of the swim lane. It is next to the second float just to the left of the double bouys on the right end of the swim lane. See the picture below for the location. If you take the time to take a reading, please do me a favor and send me a brief e-mail so I can post the water temperature for all in the group. click HERE! to send an e-mail to the Goggle group, just edit the temp. before sending. Well today was a great day, not just weather wise, but Al and I had the chance to test 20 new swimmers. The Team-In-Training group coached by fellow Orca, Dave Stark, were out for an early season training session and many members of that group have decided the Orca’s are a great way to get more open water training. I’m not sure what Dave has been sneakin’ in their Cliff Bars, but we heard nary a complaint about cold water (and believe me it was cold at 54 F!). Everyone was in great spirits and sailed right through the swim test. Once again, Al and I would like to all the folks that came down today and joined. We look forward to seeing you out there and hope you enjoy this upcoming season. I’d just like to thank our three newest members and Kevin Coady, for coming out today for their swim test. It was a beautiful sunny day with the occasional cloud, a bit on the cool side (as one can expect in February), with snow capped hills to south clearly visible from the lake. Mount Diablo to the north also had a dusting of snow, but you can’t see it from the lake. The water was a cool 52 degrees F as Dan, Jake and Julie entered the water. I didn’t see a moment’s hesitation as they entered the water for the test and they all handily completed with smiles on their faces. Moments later Kevin joined the three of them for an inaugural swim across the lake to the rock pile and back for a brisk cool mile swim. 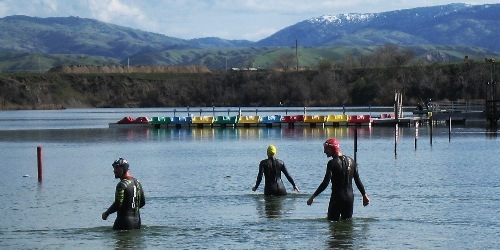 For those of you who might not think it’s time yet to start your swimming, these four prove otherwise, and have the “Coots cold water swim caps” to prove it! Hi folks, the following water temperature reading was reported Thursday evening by one of our fellow team members, Jeff. It’s been a beautiful sunny week all this week and everyone is thinking we’re on the verge of spring. I finally had a chance to briefly go down to the lake and measure the water temperature. Unfortunately, I could only go part way out in the roped off swim area and could only measure a little over a foot deep or so. That being said, the temperature was a nearly pleasant 62 degrees F (those who know me, you know where an incomprehenisble statement like that comes from). Now let’s put this in context. The day was sunny, air temp was about 77 F, the measurements were taken in the mid afternoon (around 3:00) and part of the day, we had breeze blowing in toward the beach, which tends to blow the warmed surface water right into the beach area, there’s a good chance one would hit cold patches on the surface as one swims to the far wall. But ya know, I’ll take what I can get. To put it in perspective, the past three Saturdays water temps (at about the 2-3 foot depth), have been between 51-53 F and there was nearly no surface layer to speak of, brrrr. Now this weekend, we’re supposed to have highs in the 70’s tomorrow is sunny as is Sunday, I sugest you get yourself down to the lake and go for a mid day swim, you might just really enjoy it. If you think you are, shoot me an e-mail: sign_up@shadowcliffsorcas.com, I might be able to come down and test you (after lunch on Saturday, and I might be available on Sunday) if you are thinking of joining the Orcas, or I’ll have the team caps, if you’ve not recieved yours yet. Air temp was 56 degrees, temperature was taken at 3:00 in the afternoon, it had been a mostly sunny day and the shallow swim area does tend to warm up a bit with the sun shining all day, especially if it not too beezy. Given that I was unable to wade out as far as I like, I think it contributed to the slighly warm water temperature of 50.5 F, as compared to last weeks reading.